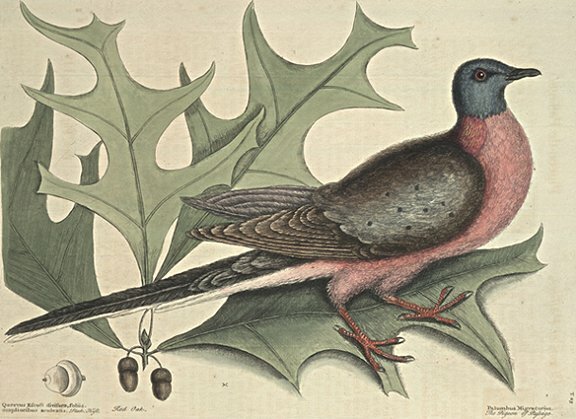 It is about the size of our English Wood-Pigeon; the Bill black; the iris of the Eye red; the Head dusky blew; the breast and belly faint red. Above the shoulder of the Wing is a patch of feathers that shines like Gold; the wing colour'd like the head, having some few spots of black, (except that the larger feathers of it are dark brown) with some white on their exterior vanes. The Tail is very long, covered with a black Feather; under wich the rest are white; the Legs and Feet red. In their passage the People of New York and Philadelphia shoot many of them as they fly, from their Balconies and Tops of Houses; and in New England there are such Numbers, that with long Poles they knock them down from their Roosts in the Night in great numbers. The only information I have had from whence they come, and their placers of breeding, was from a Canada Indian, who told me he had seen them make their Nests in Rocks by the sides of Rivers and Lakes far North of the River St. Lawrence, where he said he shot them. It is remarkable that none are ever seen to return, at least this way, and what other Rout they may take is unknown.